Documenting untold stories in bold, and accessible animated imagery is the driving passion of Social Documentation professor John Jota Leaños. His work investigates social issues through a unique hybrid of animation and documentary that interweaves popular music and colorful cartoons to tell stories long hidden or under-recognized. The San Francisco Circle of the Displaced is an historical mural project preserving moments of cultural displacement in the Bay Area. The present monument/mural series highlights six historical sites of cultural displacement and removal of peoples from the San Francisco, such as the conversion of Ohlone Indians at Mission Dolores, or Japanese internment during WWII. "Artsworks in this vein, like the Galleria de la Raza Digital Mural project, work like a billboard but with the imagery of muralism," he explains. "They're political, bringing issues together in a way that merges advertising aesthetics and tactics with muralist perspectives." Documentary methodologies, oral histories, presented with different outcomes. Leaños and his collaborator Artemio Rodgriguez recently created a "Dead Lowrider," an 1968 Chevy Impala tattooed with day of the dead images as a moving tribute to the grassroots cruising culture in California. Leaños came to UCSC three years ago after working at CCA and before that four years teaching Chicana/o Studies at Arizona State University. "Now I'm teaching documentary methodologies. It's a bit new for me but exciting," he confesses. “Teaching helps me to always keep learning," he adds with a grin. Leaños' innovative socially-inflected animated films have been shown at Sundance, Cannes and the San Francisco Festival of Animation. Last year Leaños won a Guggenheim Fellowship for the creative arts which allowed him to take a few quarters off and begin his current project, Fronteras, a trio of related animated histories of the American Southwest. Frontera! Animated Histories of the Southwest Borderlands animates the complex social history of southwest borderlands of the United States along four major river systems—the Río Grande, the Colorado, the Mississippi and the Sacramento Rivers—all through musical documentary animation. In his work on the borderlands issue, Leaños comes to grips with "the conflicted region itself, cartel violence, immigration— many issues of today intwined with a legacy going back to the year 1600," he explains. "The Pueblo revolt of 1680 in New Mexico had the indigienous people throwing out the Spanish—they wanted to go back to the old ways, reclaim their religious practices. They threw out the Spanish all the way to Mexico. "That history isn't too well known," he smiles. "And it happened simultaneously with the events at Jamestown." The social documentary filmmaker admits he's fascinated by the "history that is still here, the legacy beyond the 'Kit Carson came to town' ideology. It's important to tell these undocumented histories"
Telling the story is a challenge, Leaños admits. "The story is sacred, so we have to get it right. But obviously there's no getting it right. So it's like opening Pandora's box. We're looking at taboo issues. The challenge is how to write it in a way that is subtle yet revealing. Also, I'm aware that I'm coming in as an outsider. What right do I have trying to see and interpret the issues?" On the other hand, Leaños believes that he can use his "outsiderness" to tell the story in a larger framework, "as an American." 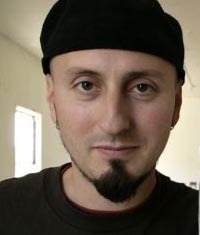 Leaños hopes to see his short animated tales on PBS, at film festivals,online sites, and interactive websites, where individual histories and subtexts can be added. "But," he sighs with a smile, "the animation has to happen first." He has used his Guggenheim to begin the series. "The issue is trying to find concentrated bits of time. It takes so long to capture even a few seconds. I have worked on this for two years." He says he's looking at a completion date of August 2013. "As artists we always have to hustle. I tell people I have two fulltime jobs—my hustle job and my university job. But they do speak to each other. I'm teaching and doing."